Select colors that create strong contrast (right), rather than colors too close in value (left). Color is what the eye notices first, so it can be a major contributor to developing a compelling design. The thoughtful use of color aids understanding of content, improving the communication quality of almost any document. It can be effective for the type itself as well as for a background. Color and type interact dynamically in a multitude of applications: logotypes, book and editorial design, packaging and product design, brochures, greeting cards, book covers, as well as CDs and posters. Color also adds interest in headlines, subheads, bulleted lists, pull quotes, initial letters and other typographic elements. Contrast is equally important when type is in reverse. An element of color serves to organize content in a tasteful yet functional way, as shown in this spread designed by Derek Chan. The proper use of color can enhance design in both obvious and subliminal ways. It can promote a mood, influence a purchase, and help create an “experience” for the viewer. Color can be applied simply to draw attention to important elements, but color associations can also communicate specific messages: red for power and energy, blue for trust and security, green for money and prosperity as well as environmental themes, and pink for femininity and romance. Because colors have different connotations in different cultures, it’s essential to research these when designing for various markets. Colored backgrounds behind black text serve to divide the different story elements in this complicated yet stylish editorial spread from U&lc (Vol. 21, No. 1, 1994) designed by Pentagram. Create strong contrast to ensure readability. Avoid the use of close values or complementary colors, which tend to decrease contrast. Less is more: too many colors or too many instances dilute effectiveness. Maintain consistency of palette and usage throughout. Use process color judiciously for text, as small type and fine details can lose their sharpness and definition. 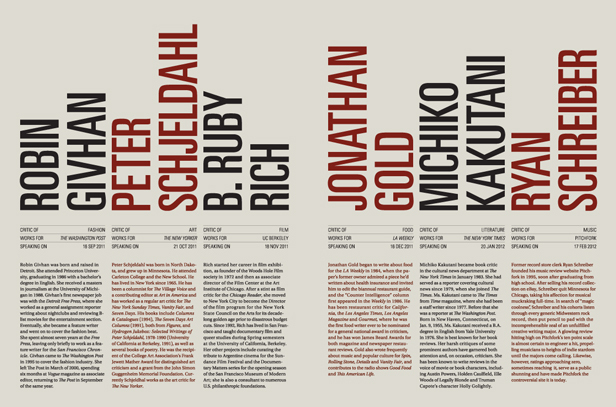 Select color-friendly typefaces, avoiding those with hairlines, thin serifs or other fine detail. Be cautious about special-effect colors: metallic/reflective, luminescent, fluorescent or brilliant, glowing colors (certain yellows, oranges, pinks, etc.). Consider the viewing surface and its reflective qualities, which can affect perception of color and contrast, as well as readability. Choose your color palette with care, and apply it purposefully. Good decisions will not be noticed; poor ones will distract. Color used well is eye-catching, an appealing way to add emphasis and interest. It is a simple way to make a good design, better.